DonorPerfect clients can collect payments outside the office via the DPMobile app on their phones and tablets. Whether at a fundraising event, or in a donor’s home or office, its simple to enter payment information directly into the phone, or “swipe” a credit card via our encrypted mobile card reader. The transaction will be processed, recorded, receipted, and acknowledged automatically! Accept higher dollar amounts with credit cards. Studies show people spend more with a credit card than using other payment methods! Collect money fast! All payments are deposited to your organization’s bank account within 2 business days. Save time processing payments at a gala, auction, golf outing or even over lunch! It’s easy! Any user of DPMobile can collect donations and payments, and it’s all integrated with your DonorPerfect Online database automatically through the cloud. 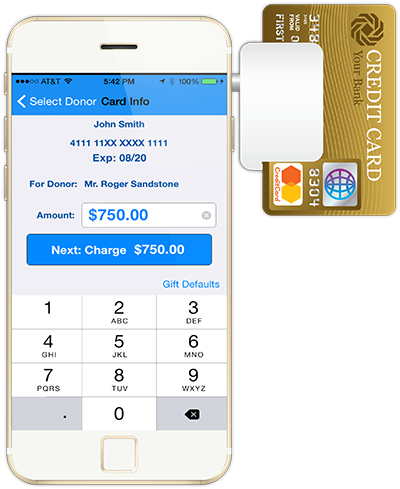 Simply type in the donor’s card information, or purchase a DPMobile Card Reader, attach it to your phone and “Swipe” payments. Once you enter the gift amount, you have the option to have the donor write their signature on the phone, then DPMobile will take care of the rest! It will immediately email a receipt and attach a default “Thank You” letter. Then, the donor’s record is updated with the payment information in DonorPerfect Online in real time. If it’s a new donor, DPMobile adds them to DonorPerfect. You can’t do that with a non-integrated system. Want to review your fundraising activity? With DPMobile, it’s easy to view a record of the mobile payments you processed using a custom time frame. All from the palm of your hand! Why DPMobile Over Other Mobile Payment Providers? DonorPerfect understands what your nonprofit needs in an integrated mobile payment tool to maximize your fundraising success with minimal effort. With DPMobile, users enter encrypted and secure payments right from their device. Because DPMobile is tied to your DonorPerfect system, the data and payments are associated with your organization, not the person making the transaction. How do I start collecting payments through DPMobile? Though DPMobile is available via the App Store and Google Play, the ability to collect payments is currently available for iOS products (Android is coming soon). You’ll need an active SafeSave™ Gateway merchant account to collect payments. If you do not have one, please sign up here. Is there an additional fee to collect payments via DP Mobile? No! If you have an existing SafeSave™ Gateway, you can start processing manual payments today! If you would like the ability to “swipe” credit cards with a card reader, you can order a device here.